MONDAY, Nov. 17, 2008 (Health.com) — Most of the bacteria that live in a healthy person’s intestines will bounce right back after they're killed during an antibiotic attack, according to a new study. But several types are wiped out by a course of Cipro, or they survive only in much smaller numbers, reports Stanford University's Les Dethlefsen, PhD, and his colleagues in this month’s issue of the journal PLoS Biology. 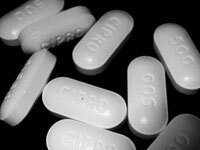 Overall, about 30% of the bacterial types found in the intestine showed dramatic population changes after a course of ciprofloxacin. The majority of bacteria rebounded four weeks later. “We have no idea what the consequences of that are,” Dethlefsen says. None of the three healthy volunteers participating in the study got sick, but the alteration of their bacterial ecosystem could have longer-term, subtler effects, he adds. The bugs in human guts are a hot topic these days. Probiotics can be used to colonize the intestines with “good guy” microbes. While the jury’s out on whether these supplements have any effect on the gut’s bacterial environment, it is clear that not having a thriving microbial community in one’s intestines can be dangerous, with consequences ranging from a day or two of diarrhea to life-threatening infection with a nasty bug called Clostridium difficile, which can gain a foothold in patients treated with antibiotics. “We have a very complex, diverse microbial community that lives in our guts and does all kinds of amazing things for us,” Dethlefsen says. Not only do bacteria help to digest food and extract nutrients from food, but they also protect from infection, help regulate the immune system, and may even have a say in the timing of birth. In the current study, Dethlefsen and his team used a technique called pyrosequencing to take a microbial head count from the stool samples of study participants before they took a short course of ciprofloxacin; then researchers took four more samples over the following eight months. The technique involves reading a specific section of genetic material from every one of hundreds of thousands of microbes, making it possible to identify many of the thousands of different organisms present in the gut and determine their relative abundance. The researchers spotted up to 5,700 bacteria types in each person before the antibiotic was administered. After the volunteers took Cipro, the gut-bug populations looked a lot different. Overall, 30% of the bacterial types showed dramatic changes in their population. One volunteer in the study had an 82% reduction in the diversity of his gut microflora; one had lost 63%; the third had lost 36%. However, within four weeks, study participants’ gut bacteria diversity was back to normal. “That the community can be severely perturbed and then bounce back is very encouraging,” notes Dethlefsen, adding that the findings show there’s probably no reason for healthy people to “freak out” about the effects of antibiotics on their digestive systems. The fact that the volunteers had no digestive problems despite the profound alteration in their gut bacteria suggests that other bacteria took over the jobs of the missing bugs until their population rebounded, he explains. Still, the health effects of obliterating certain bacteria with a short course of Cipro—which is generally considered to have a relatively benign effect on digestive system bacteria—are unknown, Dethlefsen says. None of the bacteria that were wiped out, or whose populations were sharply reduced, have any known effects on human health, he adds. “To me, this looks like a very early step in a whole line of research that can really help us understand what are some of the driving forces in developing antibiotic-related diarrhea, in general, and C. difficile, specifically,” says Marya Zilberberg, MD, a professor at the University of Massachusetts, in Amherst, whose research has helped show that C. difficile infections are becoming more common—and more deadly—in the United States. In the meantime, Dr. Zilberberg thinks that the findings confirm that it’s crucial to be an “educated consumer” when it comes to antibiotics. “Don’t say yes to a prescription of antibiotics unless you’re convinced that you really need those antibiotics, because they’re not without risk,” she says. Previous research had suggested that there were maybe 500 bacterial species in the intestines, but more sophisticated techniques are now showing that there are more. Dr. Gerding also says that it had long been suspected that antibiotics destroy some beneficial bacteria, which is why some people became vulnerable to C. difficile. “Antibiotics should not be used casually simply because there doesn’t seem to be a downside,” he warns.